Figure 1. 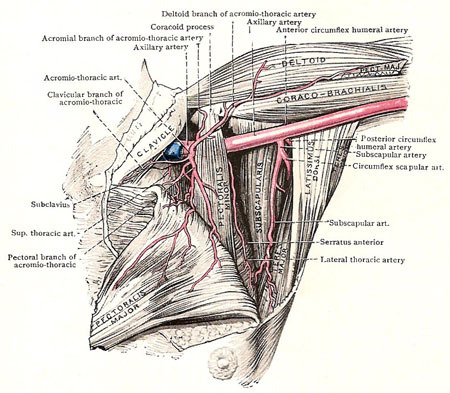 Dissection of the axillary artery and its branches. Figure 2. Axillary vessels and nerves. Source: Cunningham's Manual of Practical Anatomy, 11th ed., 1942. The axillary artery is the chief artery of the upper limb. The axillary artery supplies the arm, axilla (armpit), and chest wall. It begins, as a continuation of the subclavian artery, at the outer border of the first rib, enters the axilla through its apex, and runs along the lateral wall to the lower border of the teres major. There is leaves the axilla and becomes the brachial artery. The direction which the artery takes naturally varies the position of the limb. For convenience of description, the axillary artery is usually divided into three parts – the part above the pectoralis minor, the part behind it, and the part below it. They are known respectively as the first, second, and third parts. The three thick cords that form the lower part of the brachial plexus are closely related to the first and second parts of the artery; and the large nerves that spring from the cords are grouped round the third part. The first part of the axillary artery lies very deeply, behind the clavicular part of the pectoralis major, the clavipectoral fascia, and the vessels and nerves superficial to it. It is also enveloped, along with the axillary vein and brachial plexus, in a funnel-shaped sheath which is prolonged over them from the deep fascia of the neck. Posteriorly, it is separated from the first intercostal space and the first digitation of the serratus anterior by the nerve to that muscle and the medial cord of the brachial plexus. The axillary vein is on its medial side, and overlaps its anterior surface slightly; above and to its lateral side there are the lateral and posterior cords of the brachial plexus. The second part of the axillary artery is located behind the two pectoral muscles, and has the three cords of the brachial plexus disposed around it. The axillary vein is still medial to it, but is separated by the medial cord. The third part of the axillary artery is the longest part. It is superficial in its lower half, because the anterior wall of the axilla does not extend so far down as the posterior. The upper half of the third part is covered by the pectoralis major but its lower half by the skin and fasciae only. The medial root of the median nerve crosses in front of it at the lower border of the pectoralis minor. The circumflex nerve and the radial nerve lie between it and the posterior wall of the axilla. 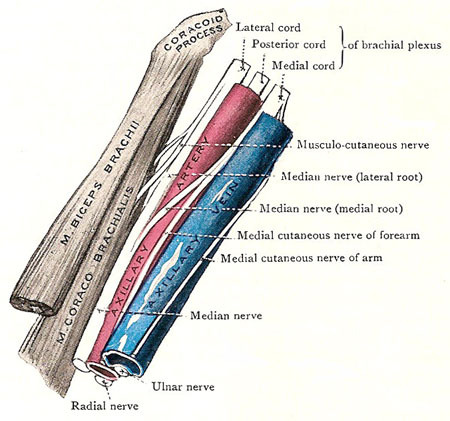 The coracobrachialis muscle is on its lateral side, and also the median and musculocutaneous nerves, which lie between the muscle and the artery. The axillary vein is on the medial side of the artery, with the medial cutaneous nerve of the arm lies along the medial side of the vein. The superior thoracic artery is a small branch that ramifies on the upper part of the medial wall of the axilla. The acromiothoracic artery is a short, wide trunk which has its origin under cover of the pectoralis minor. It winds round the upper border of that muscle, pierces the clavipectoral fascia, and immediately divides into four small branches which diverge from one another and supply neighboring structures; the largest of them runs downward between the pectoralis muscles. The veins that accompany those branches end in the cephalic vein. The lateral thoracic artery, skirting the lower border of the pectoralis minor, proceeds downward and medially to the side of the thorax. In the female, it is an important source of supply to the lateral part of the mammary gland. The subscapular artery is the largest branch of the axillary. It runs downward and backward along the lower border of the subscapularis to the inferior angle of the scapula, giving off muscular branches. Note that it ends by entering the latissimus dorsi with the nerve to that muscle – a notable example of a neurovascular hilum. Its largest branch is the circumflex scapular artery, which springs from it an inch below its origin, and takes a large share in the anastomosis around the scapula. The two circumflex humeral arteries arise at the same level – a short distance below the subscapular artery. The posterior circumflex humeral artery is much the larger of the two. It springs from the back of the axillary artery, and at once passes backward, with the circumflex nerve, in the interval between the subscapularis and teres major muscles on the medial side of the surgical neck of the humerus, below the shoulder joint; and, curving round the surgical neck, under cover of the deltoid muscle, it is spent chiefly in supplying that muscle. The anterior circumflex humeral artery runs laterally, in front of the surgical neck of the humerus, under cover of the coraco-brachialis and short head of the biceps brachii. Reaching the bicipital groove, it divides into two branches, one of which runs up the shoulder joint, while the anastomoses with twigs of the posterior circumflex artery.